Photo courtesy of the Lyric Opera. I realize that today's discussion about Alban Berg's Wozzeck, currently on stage at the Lyric Opera, will not be everyone's cup of tea. But the opera puzzled and irked me and, trying to make sense of the thing, I turned to the Lyric's General Director, Anthony Freud, for help. He was such a sport, that while we sail off into deep waters, I hope you will either tag along with us or, if you do not care to, forgive me and show up tomorrow, when we'll be hearing what Caitlyn Jenner has to say on her visit to Chicago. The Magic Flute is beautiful and happy. Madame Butterfly is beautiful but not happy. And Alban Berg's Wozzeck is neither beautiful nor happy, though others disagree, at least about the "beautiful" part. The critics at both Chicago papers raved about it. What did they hear that I didn't? I last experienced—I almost said "endured"—Wozzeck when the Lyric performed it 23 years ago and, not to mince words, hated it. It struck me as shrill and ugly, an ordeal imposed upon the audience for reasons mysterious. It would be exaggerating to say I enjoyed it more on my second viewing, but I disliked it less, and found myself plunged into thought, even as it was unfolding, asking questions like, "Why are they doing this?" then "Why am I seeing it?" and "How can people like this?" The plot, thin as it is, matters more than the plots of most operas. It is about a common soldier, Wozzeck, living a life of regimented brutality as the servant of the swinish Captain. His love, Marie, the mother of his child, is canoodling a vile Drum Major. A team of grim doctors gleefully anticipates the fame that will be theirs when Wozzeck's condition, whatever it is, is fully dissected. Spoiler alert: it does not end well. The music is atonal, meaning that there are not lush harmonies that swell and follow rhythmic patters we associate with songs. There is nothing to hum. I could easily have shrugged it off as the kind of eat-you-peas homework plucked out of the long history of opera that the Lyric feels compelled to inflict upon its audience, out of a strange compulsion to shine its light into the darkest corner of the canon, the way art museums intersperse their Monet and Van Gogh and Renoir shows with the occasional rude black and white slashing shock of Franz Kline. director, Anthony Freud, asking him to help me. "Why are we doing it?" Freud mused. "I think it is, in common with all great art, about the human condition, about post-traumatic stress disorder, about poverty, about the relationship between an oppressive society and and oppressive system, and about people making moral judgements. In my mind, it's an incredibly topical story." "So it's about modernity?" I blubbered. The romantic age could be expressed with murmuring Bach harmonies but once you started gassing people in trenches you required something that sounds as awful as the reality it represents? "If you are talking about music, that's completely subjective," Freud replied. "You are entitled to find it ugly. I find it incredibly expressive, moment by moment, describing the characters' thoughts, feelings, relationships. I think there is a lot of really beautiful music." Freud's reference to the characters' thoughts "moment by moment," made me think of James Joyce, and I received a whiff of the philistinism that might be underlying my complaint with Wozzeck. If somebody told me that, heck, why chew on Ulysses, where you have to consult Cliff's Notes just to realize somebody is taking a piss, when you can slurp down a dozen Agatha Christie mysteries, one after another, like milkshakes? And the answer is that Joyce is trying to replicate the sweat and funk of granular reality in words, which is not always pretty but ultimately worth the heavy lifting. Not everything in life is fun and beautiful. Why should art be? But Freud said there is beauty aplenty in Wozzeck, if you know where to find it. "All of Marie's music is really lyrical, " he said. "The third scene of Act 1, the opening of act 3, very beautiful; a kind of aria in the 3rd scene — the way Berg writes for Wozzeck is totally different, music capturing the jagged, angular moment." That's it, isn't it? If reality were one long carnival, we could move happily from Puccini to Mozart and back. But the reality of war and death jars, and so does Wozzeck. My go-to-man on these issues, Henry W. Simon, says it quite well. Berg and his operas Wozzeck and Lulu epitomizes one aspect of a certain time and place. Wozzeck was conceived during World War I; its composition was completed immediately after that war; and it received its first stage performance, in Berlin, in 1925. It deeply stirred all of Middle Europe of that period. And that period was the period of Dr. Sigmund Freud, the period of Franz Kafka, the period of the rise of National Socialism. In music it was the period that saw the most violent breakdown of old ideas of melody—and, even more, of harmony. It was revolutionary, it was intellectually curious, it was unstable, and it reflected the sickness of the German soul. But Freud—the director, not the doctor—would not yield the field on the loveliness of the piece. "The orchestral interlude, the passacaglia between the penultimate scene and the final scene, Wozzeck has just been drowned and we're about to be confronted with the horror of the ending: all we can hope for in the future is more of the same," said Freud. "It is a catharsis, in an orchestral interlude, up to that point are incredibly short, 20 and 30 seconds, here we have an emotional climax of the piece that is extraordinarily expressive, to my ears, an intensely emotional passage, lasting three or four minutes, an eternity in the context of Wozzeck. In it, I hear Puccini, I hear Mahler, I hear a music founded in Romanticism. I think Berg constantly shifts, the whole idea of atonality means no more music anchored in predictable keys or series of patterns. It's completely free to respond moment by moment to characters ' thoughts, actions, it's full of tune but the tunes last three seconds rather than 30 seconds. If you consider it was created in 1925, it was a time of shock in art, and Wozzeck stands out because, while we came to embrace certain radical works, lessening their impact, it still has a sting. "Picasso's portraits, when they were created regarded as utterly radical and offensive," said Freud. "Now they possess a classicism of their own ,compared to what has happened to visual arts since. One of extraordinary things about Wozzeck, a piece 90 years old next month,, is this: in which other art form would a 90 year piece be regarded as modern? Yet it is radical. It is revolutionary. Berg forged ahead in way he composed, in way he structured , but it is anchored in tradition. He is not rejecting tradition. He values his inheritance, but sees himself as a champion of moving that inheritance in new directions....It is now nearly 100 years old, yet it speaks to us as if it were written today. Our our ears are more accustomed to more comfortable sounds, but actually I think Beethoven, in his day, was as radical as Berg." Beethoven died nearly a century before the premiere of Wozzeck. Maybe that's the problem. At 90 years old, Wozzeck is too new to be comfortable, not yet. But that's coming. Maybe in 2115, a dilettante-yet-unborn will emerge from the Civic Opera House, blinking into the day after seeing Pffft! an opera composed in 2020 using chainsaws and chickens in vises, and think. "Heck, what was that? Why can't they put on something fun, a good old classic opera, like Wozzeck?" Something to look forward to. To be honest, after talking to Anthony Freud, I'm tempted to see it again, just to see if I can draw more out of it. Third time's the charm. For those similarly inclined, "Wozzeck," three shows remain: Nov. 12, 16 and 21. Glad you wrote about this, as I'll be seeing it myself. I'll probably print this out and take it with me, or at least read it a few times beforehand, to try and better understand the meaning of what I'll be watching and hearing. Well the story line sounds interesting. Something more apropos to the miserable Industrial Revolution era in sentiment if not in actuality of the workplace. I'm reminded of poor Bizet, the composer of the most popular opera of all time, counting highschool performances. Everybody hated it. He died. Everybody came to love Carmen. At least all of us philistines. Here is a link to a 1970 film version of Wozzeck, with english subtitles. The character, Herr Doktor Sargnagal, has an interesting name. Not suitable for private practice, fortunately he found government work. Mr. S, you don't write much about another classic art/ dance form: ballet. That doesn't interest you? You're a better man than I am, Neil. My view is that life is too short to listen to atonal music, which IMO is to real music what random blobs of paint are to real art. I am a theater nut who tries to like opera and usually fails. Every few years I go to the Lyric and usually marvel at the lack of rhythm, melody and harmony, and the simplistic narratives. I usually ponder the fable of the Emperor's New Clothes and long for the tedium to end. I have friends who I admire and look up to who are obsessed with opera so I often wonder if the problem is my own. I keep going in the hopes of a breakthrough on my part. I read about Wozzeck. I thought I would give it a shot. Aside from the fact that it's plot makes Kafka's the Metamorphosis look like an after school special, I thought Wozzeck was an extraordinary work of art. The staging was wonderful, the singing and acting superb, I found it more dynamic, less static, than most operas I've seen (Dr. Atomic was like watching grass grow). Surprisingly, I loved the music. I was told that it was challenging to listen to but I thought it was wonderful. I intend to buy a CD of the music for repeat listening and study. Who knows why some art speaks to us and other art doesn't at all. I thought Wozzeck, in spite of it's depressing subject matter, was collaborative art of the first order. Now about that final scene with the orphaned child . . . I may never sleep again. The famous English music critic Ernest Newman once observed that certain works remain in the repertory because the great musicians of the age want to play them and audiences want to hear them. With "Wozzeck" I suspect it's the former rather than the later cpnsideration that holds the greatest sway. But, that said, this was my third Wozzeck, and I found much to admire, and even enjoy. The stagecraft -- sets, acting and direction --is admirable, and, although nobody leaves the theatre humming the tunes, the music has moments of real beauty, particularly the orchestral interludes. I'm not sure I heard in it all that Mr. Freud did, but am getting there. .
And it's the only opera this season that's over in time for me to catch a 9:30 train. I do think you should give it another listen, particularly since you have invested so much in understanding its history and aesthetic. The analogy with "Ulysses" is a good one. Unless you're just rereading it for the dirty bits, it's an onion with many layers worth peeling. As I've probably said before, I enjoyed "The Sound of Music," but don't care ever to hear it again. I wouldn't make the same claim about "Wozzeck." But, as Saint Augustine said about something else, "not just yet." If "Wozzeck" has given you a headache you will find "The Merry Widow" a nice musical analgesic. Talk about polar opposites! Spoiler alert: I'm a philistine myself, who understands less about music than Mike Huckleberry does about evolution. But, I know what I like, which includes Beethoven. As for "Wozzeck", which I've never seen, nor would contemplate seeing, "It is revolutionary." ... "I think Beethoven, in his day, was as radical as Berg." One difference, it would seem to me, is that Beethoven won the war, decisively, and most of classical music went his way shortly thereafter. With good reason, I believe. Berg's revolution is still going on, and atonal music is no closer to winning the war than it was 90 years ago, which is why "Wozzeck" is still "regarded as modern." To wit: the number of "old-fashioned" operas performed at the Lyric (or almost anywhere else), compared to the number of atonal ones. The customers aren't ALWAYS right, but they are in this case, IMHO. Which is why Sandy got her main floor "Wozzeck" tickets for $49, IIRC. Same here with appreciating classical art over modern art at the Art Institute. Ever the optimist, I would anticipate neither Hell nor high water to bar your finding something to enjoy, Sandy. And I think reviewing what Neil has offered on the subject as preparation is a good idea. And Jakash, I'm not one but think most musicologists would have trouble with your military analogy. Everybody likes Beethoven, but he didn't create a blueprint for successors to follow blindly. Rather an inspiration and foundation to build on in evolving the art. And as far as being revolutionary, Wagner's "Tristan und Isolde" was probably more of a new direction than anything Berg wrote. 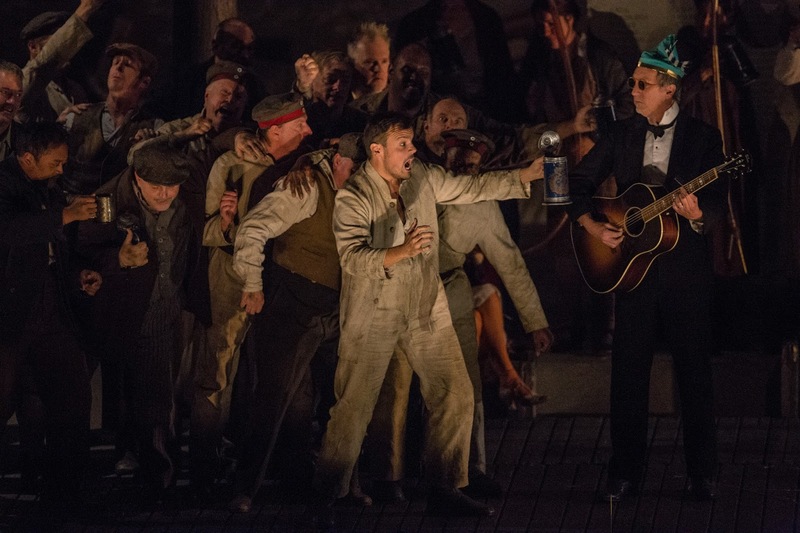 It's not surprising that Wozzeck is a hard sell for Chicago's conservative opera audience, but I don't think that is necessarily cause for celebration. Berg never wanted the music to be noticed, he wanted it to be more of a background noise if you will. So the music isn't the point here, it's the story. The composer wanted you to be moved by the actions on stage and if that happens that's what he wanted. A point to Scribe, atonal doesn't mean just random notes thrown on the page. There is structure and form, unless it's a piece for fixed piano, then its a free-for-all. One more Berg quote for fun- "When I compose I always feel like I am Beethoven; only afterwards do I become aware that at best I am only Bizet." That makes a lot of sense, Nikki. A couple of great quotes. They're going into my mishmash book. I think the term for "random notes thrown on a page" would be "stochastic," which some modern composers have resorted to. Who knew that Berg could be witty? Having reached an age where I no longer worry about being thought of as a Philistine, I say, "I'm not sitting through that!" And I speak German, and the tedium of the libretto adds to my determination not to submit myself to this ear bashing.